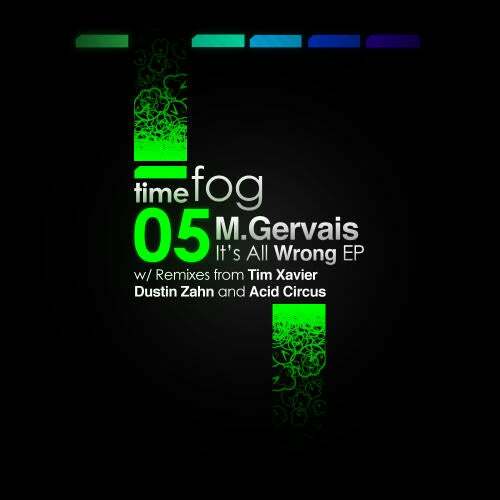 Timefog boss M.Gervais returns for his second offering. Crunchy techno to make your speakers sizzle! Pumping bass and echoes from high-pressure submarines slice from dark, profound depths, opening into a sleek, modern techno vibe with a nod to the memorable drones of a certain traffic jam, complimented with a touch of morphing Plastikman meltdowns, descending bass and unexpected effects. This is certainly a heady track that will do serious damage on the floor. Berlin dweller Tim Xavier (Clink) throws his hat in the ring to take a swing as well. His take brings a droning build to dizzying rollercoaster heights before plunging down into the twists and turns of weiss-hot screaming techno. Compressed claps and extra clatter in the background make for a busier journey, drifting back into the break from the beginning to begin again! Dustin Zahn (Drumcode, Rekids, Enemy) works it out for a harder, darker warehouse vibe for fans of Mark Broom. Raw claps, reverberating bass, air raid alarms, seething shakers, and an incessant buzz make this prime time anthem material for strobe-drenched darkness, with numeric shouts and clamorous rusty metallic smashes ushering in several peaks and valleys. DROID tag team Acid Circus are all over this thing like ketchup on burgers. Stripping the beginning back to an effective jackin DJ tool and tightening up some random interjections, this treatment will be prime for big soundsystems and, well, basically beating your cute little face, Chuck Norris style. Racing ramping low end sound and tapping thunks light the fire under holographic reflections of halogen sound. Wailing chaos sirens drop over the sprint to the end, joining in to raise the energy level of a big room, anchored in place by kung fu chops and hyperdrive pads. This is a tool for pumping up the intensity, storming rhinocerous techno that will gore you in the face, then lay down in the shade after the race.